Are you in love with suede as much as I am? In today’s article, I am more than happy to share with you suede skirt outfits to try this Autumn. This soft and delicate fabric is my favorite one right after leather. Every lady can wear this beautiful bottom. Personally, I do like this fabric for its delicate and soft touch. The look of this material makes a cozy feeling and impression. All you need is to find appropriate tops to create a functional look that will work for all cold season long. Keep on reading to see tricks and tips on how to style it with your favorite tops and jackets. The first combo you might like to try is the suede skirt paired with a shirt. If it’s still warm outside, then you might like to try on a sweet looking purple button-down shirt and tuck it inside the dark purple mini skirt. You can wear this pairing to the Friday’s office. If it’s quite chilly outside, then the best pairing might be a suede skirt and sweater. Personally, I consider this look to be very preppy. Why do I like it? It’s chic and ultra feminine. How about combining a suede skirt with a leather jacket? I am so in love with this wonderful contrasting look. If you want to try on something more classy, preppy and retro-inspired, then keep an eye on suede and trench coat combination. This combo will give you a stunning structured silhouette that will keep your look chic and simple. Another edgy look can be achieved thanks to suede skirt and tights combo. Go for a mini suede skirt and protect your legs from being frozen thanks to cozy tights or leggings. This is a perfect way to show-off your beautiful legs. 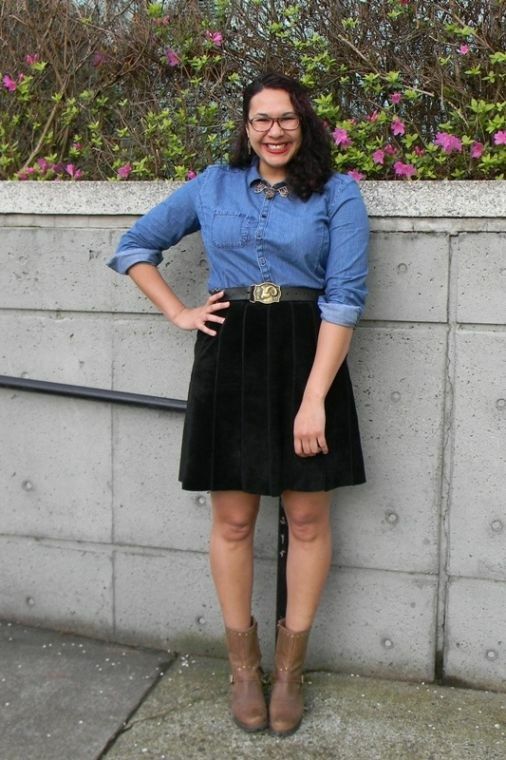 The last but not least is the suede skirt and boots pairing. Protect your legs from the cold by wearing boots. Go for ankle-length styles or choose high boots. Anyway, I would love to hear your own thoughts about this pretty and ladylike garment. Let me know what you think in the comments below. All these outfits look pretty chic! Love the lightweight sleeveless cream-white trench-coat worn over light tunic teamed with suede skirt and beige heeled sandals. The basic gray tee teamed with fringed suede skirt is a fabulous combination and I simply felt in love with an off-shoulder black top tucked in front buttoned suede skirt completed with high caged gladiator sandals. Speaking of tops, check out my post on off-shoulder trend for women, you will see many inspiring ways how to wear it nowadays. 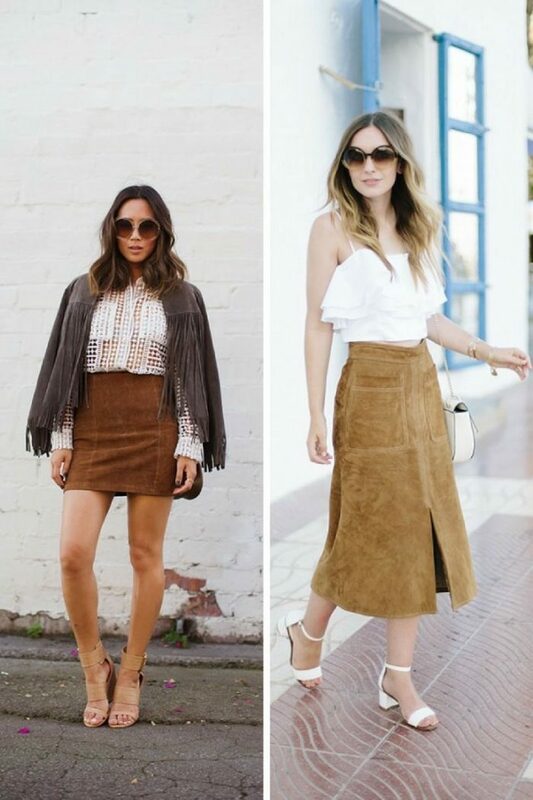 Do You have any thoughts about Suede Skirts To Try Now? 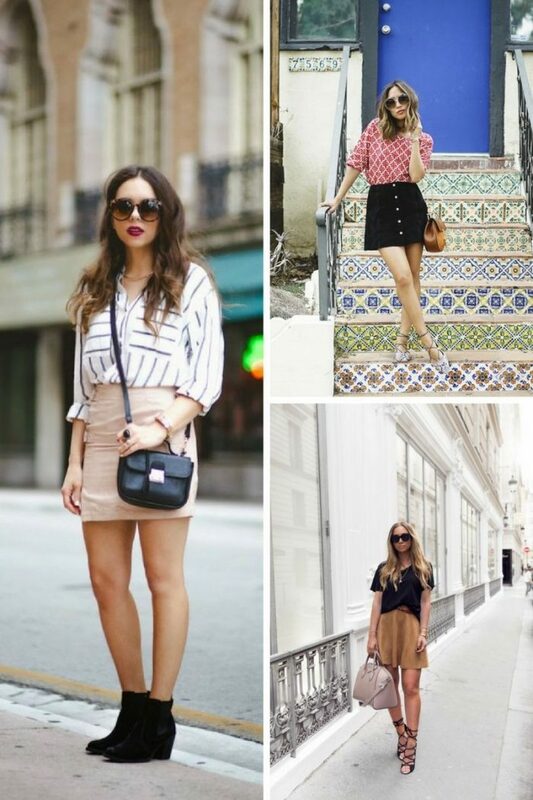 Here are Fashion Tips pictures and trendy women’s outfits which are in style in 2019: Ankle Boots, Best Sweaters For Women, Fashion Trends For Women Boots, How To Wear Trench Coats For Women, Leggings, Must Have Fashion Trends For Women, Street Style Women's Fashion And Inspiration, Suede Skirts and tips on how to wear them on the streets.